Silvio Berlusconi’s remarkable comeback ahead of Italy’s election has revived a hope for actually Europe as a whole. Berlusconi’s status as a billionaire could actually save Europe if he wants to really lead the way for both Germany and France are on walk-abouts and the European continent is at risk even from Russia because it perceives weakness. Italy’s recurring nightmare has always been its left wing. When I was in high school, I went to Rome. There was a demonstration with tens of thousands of people marching with communist flags. It scared the hell out me. 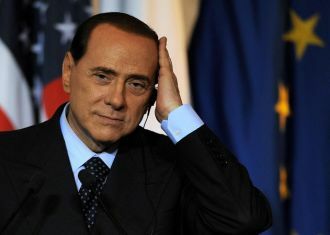 Berlusconi has surged because the left has imposed a property tax. He has a chance to make Italy a real leader. Let’s hope he does the right thing. If anyone can think out of the box and take bold steps in a new direction to show the world Italy is returning, it is Berlusconi. We need someone to champion economic sanity. Someone who will face the truth that you cannot tax your way to prosperity. All of this raising of taxes is the greatest transfer of wealth in history.